Now Chrome OS will be able to run Android apps in the background. The biggest disadvantage of using Chrome OS is that apps on it don’t work as desktop software are supposed to. Google has been trying to overcome this shortcoming and looks like with Chrome OS 64, it will be achieved. Android apps when running on Chrome OS, pause whenever the focus is shifted from them. This is a hindrance for the people who often do heavy-duty multitasking. HOW IS IT POSSIBLE NOW? Now with the latest update, Google has launched a feature called Android Parallel Tasks within Chrome OS 64. It is currently available on Google’s beta channel. The feature will soon be available in public version of Chrome OS in near future. However, it is still not clear, when it’s going to get released. Google is working on making Android apps on Chrome OS more compatible, sturdy and desktop-like. Google will no longer be selling Pixel C on its online store. 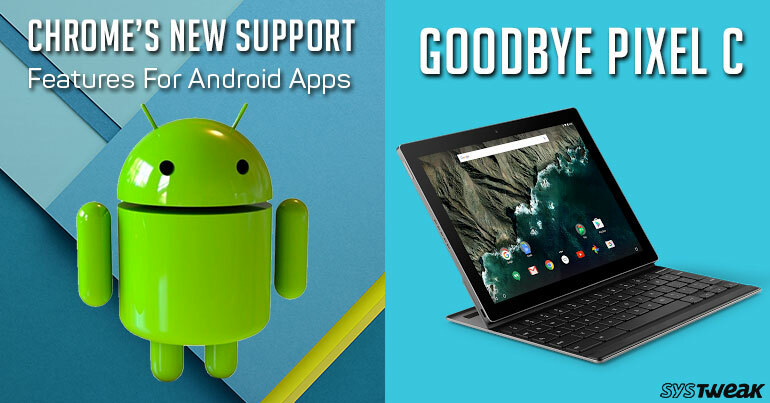 Google has recently launched Pixel Notebook and now it will stop selling Pixel C through its online store. The end of sale represented the end of life for this Pixel device. Although, Google will not stop supporting the hardware in future. This seems to be a reverse lateral shift in focus from Pixel C to Pixelbook as many in the industry has moved from slates to convertibles. Well, Pixel Book is not slim as a tablet but it is a versatile computing device. However, there is a slight bump on the road, the price seems to be higher. For Pixel C you need to pay $599 (plus keyboard)(starting range) wherein you need to spend $999 to make the Pixelbook’s lowest SKU yours.